Trust Us, This Is All Made Up is, at first glance, a concert film, one that focuses on a little-understood art form considered by many laypeople to be the provenance of liberal-arts school freshman and/or failed class clowns. The first straight-up documentary by mockumentarian Alex Karpovsky (Woodpecker, The Hole Story), Trust Us is indeed a cinematic record of an essentially fleeting experience: an improvisational performance by legendary duo David Pasquesi and TJ Jagodowski. TJ & Dave, as they are known to their fans, are Gods of their misunderstood medium, seasoned players who create long form sketches that resemble Pinter plays more closely than they do drama club warm ups. 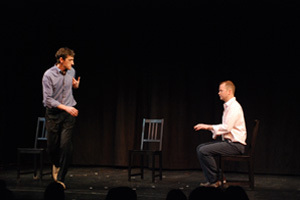 Once a month, the team hits the stage at New York’s Barrow Street Theater to hypnotize audiences with these shockingly cohesive exercises in immediacy. Karpovsky records one such performance from start to finish. Upon further inspection, Trust Us reveals itself to be something far more ambitious and complex than its concert film label would imply. Maybe it’s a result of Karpovsky’s cunning direction and creative editing, which utilizes a split screen to formally mimic the way that TJ and Dave separate and merge, the unknowable but pre-ordained cellular activity of their partnership. Karpovsky’s energetic work from behind the camera gives aesthetic life and structure to what might otherwise seem like a second-rate way of seeing a first-rate feat of mental agility. How they do it, and why they do it, form the central, and unanswerable, questions of the film. There is something decidedly New Agey about the nebulous magic that descends upon TJ and Dave when it’s time to perform. The way they describe their mystical connection to each other, and to a catalogue of invented characters, is more like listening to a guided meditation than hearing an artist bloviating about process. They live at the center of a mandala, finding security and satisfaction in the act of not knowing. Filmmakers are, as a rule, a neurotic bunch. We’re also constantly at the mercy of earthly powers beyond our control as we attempt to turn an idea into a reality. TJ and Dave’s remarkable give-and-take serves as a healthy reminder of the true immediacy of creativity. So does Karpovsky’s tricky, transcendent little movie.